FAA L810 RED LED Obstruction Light Solar Powered and Solar Powered L-810 FAA Red Obstruction Light Solar Powered L-810 Obstruction Light LED FAA Type: L-810 Steady-Burning ICAO Type: Low Intensity Obstacle Light Zone 2. Military FAA RED LED Obstruction Light L-810 Solar Powered and Solar Powered L-810 FAA Red Obstruction Light Solar Powered L-810 Obstruction Light LED FAA Type: L-810 Steady-Burning ICAO Type: Low Intensity Obstacle Light Zone 4 - MIL Military Grade. Military FAA RED LED Obstruction Light L810 Solar Powered and Solar Powered L-810 FAA Red Obstruction Light Solar Powered L-810 Obstruction Light LED FAA Type: L-810 Steady-Burning ICAO Type: Low Intensity Obstacle Light Zone 2. Completely self-contained LED light designed for a range of emergency aviation applications including Obstruction, runway, threshold, approach, helipad and tactical airfield lighting. 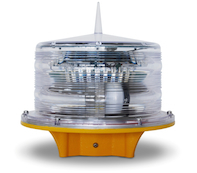 Solar Powered FAA Certified L-864 LED Red Beacon. FAA L-864 Medium intensity solar powered aviation obstruction light, Solar Powered FAA Certified L-864 LED Red Beacon. L-864 Flashing Red Beacon Solar Obstruction Lights, FAA L-864 Medium intensity solar powered aviation obstruction light, Solar Powered FAA Certified L-864 LED Red Beacon. Red Solar Obstruction Light Red 20 Ultra-Hight intensity LEDs RED.